Auramarine is able to offer a fast, reliable and affordable service when a switch to low-sulphur fuel is needed. 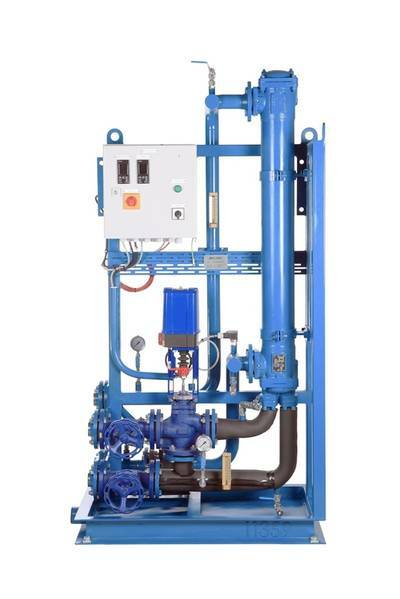 Their equipment consists of three units: FO Supply unit, MGO Cooling System, and Auramarine Fuel Selector - an automatic system that controls the HFO/MGO change-over procedure. The new tightened sulphur emission rules will become effective in the Baltic Sea, the North Sea, the English Channel and North America in 2015. The time for making the alterations required by the new regulations is running short. The easiest, fastest and the most cost-effective solution to meet the challenges of reducing sulphur emissions is to switch to MGO, which only contains 0.1% sulphur. The emission limits can be met easily by using fuel that contains less sulphur. Auramarine Fuel Selector makes it possible to program the change-over procedure from one fuel to another to take place fully automatically. The system also ensures that the temperature change process is slow enough. The temperature of the fuel entering the engine must not change by more than about 2°C per minute. The manufacturers say that their Auramarine Fuel Selector offers shipping companies an easy, fast and cost-efficient solution for entering the new era of lower sulphur emissions required by the new regulations. The company has been one of the world’s leading manufacturer of fuel oil supply systems for over 30 years. Having wide-ranging experience in liquid flows, utilized in the design and manufacture of cooling water and lubrication oil units and BWT systems.